Wooden Dulang or Dulang Kayu Bali is used as a place of offerings, serving fruit, pastries, reading, and also important in making "gebogan". The top of dulang resembles a round tray, supported by a single pole widening downward. This pole serves as a handle, is formed in such a way, so it is stable (no sway) when placed on a flat plane. 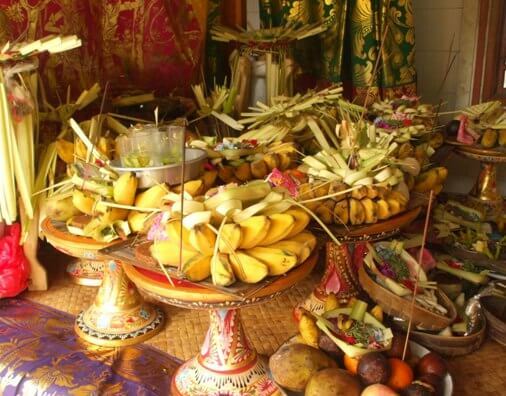 Balinese dulang is normally used as a place for offerings, which is made sincerely devoted to the Creator. 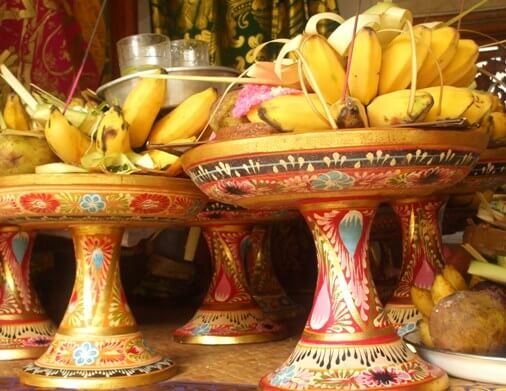 The dulang are usually placed on the "Bale", to prop offerings such as fruit, cakes, fabrics, ornaments, etc. Dulang that is made of wood has been captured the hearts of consumers, in addition to the strong material also has a relatively cheap price. However, the manufacturing process takes quite a long time. After the raw materials were collected, then formed into a rough shape continues to lathing process for 20-30 minutes. The semi-finished dulang is then dried in the shade for 2-3 months, up to a maximum evaporation of water content. The craftsmen really avoid the process of drying directly under the sunlight, because this will make the dulang cracking. Once the water content is reduced and the wood becomes dry, then layered by the base paint so that the surface becomes smoother and the pores of the wood covered. Then proceed with the final process, staining. The wooden dulang is adorned with motif, color, or prada, so that it looks beautiful and artistic. The manufacture center of dulang wood in Bali is located in Bangli regency, precisely in Dusun Tegalasah, Tembuku Village, Bangli. Here, the craftsmen produce dulang in a household scale, involving family members and close relatives. It becomes a job, although small in scale, but quite capable of moving the family economy.